At least one spouse must live in Texas for six months before filing, and the spouse who files for divorce must live in the county where the divorce will be filed for at least 90 days before filing. Insupportability is the no-fault grounds for divorce in Texas. Insupportability has nothing to do with money or support. It's basically what other states refer to as irreconcilable differences. If personal conflict between you and your spouse has destroyed the purpose of the marriage and there's no reasonable hope for reconciliation, you have met the grounds for insupportability. The spouse filing for divorce (Petitioner) files in his or her county District Court. Compared to other states, the standard child support calculation in Texas is very straight-forward because it's based on a flat percentage of the net income of the parent paying support. However, if you and your spouse have agreed to a different child support amount than the amount calculated under the Texas Child Support Guidelines, the DivorceWriter interview makes it easy to enter your chosen support. 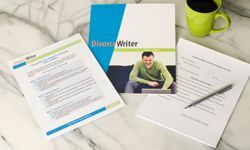 You have qualified to use DivorceWriter to complete your Texas divorce papers online. Select "Continue" to start the interview.